The Sirius Consortium asked the 109,298,291 Interstellar Circuit Court, located in Bolingbrook’s Clow UFO Base, to return the body of one its citizens. The alien, known as Ata among UFO human UFO believers, was a six inch tall alien that died 100 years ago when its craft crashed in Chile. 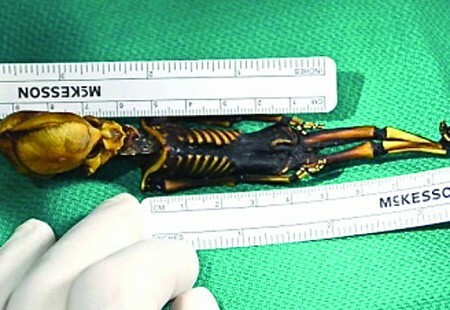 His body was uncovered in 2003, and eventually came into the possession of Dr. Stephen Greer, founder of the Center for the Study of Extraterrestrial Intelligence. Ata, who’s real name was Xel Kodo, is now the subject of a recently released documentary, Sirius. Pal Kodo, a descendent of Xel, denounced Greer and the its use of Xel’s body. Opacdox, council for the Consortium, argued under humanity’s treaties with the greater interstellar community, Xel’s body needed to be returned to immediately. Jeff Wagg, the New World Order’s ambassador to Clow UFO Base, testified that the body could not be returned without arousing suspicions. According to Wagg, the NWO is working on discrediting Greer’s work before they attempt to return Xel to Sirius. Wagg cited a study declaring that the Xel is actually the body of a deformed 6-8 year old human. The NWO is also flooding the Internet with bad reviews of the movie. They are also working with new Huffington Post blogger Sharon Hill to further discredit Greer. The court is expected to hear more testimony this week, and a ruling is expected in June. Greer could not be reached for comment.